Load up your family of four and see just how fun and easy camping can be with this Trail Runner travel trailer by Heartland. Along the rear there is a U-shaped dinette where you can enjoy your meals, and at night you can convert the dinette into additional sleeping space. 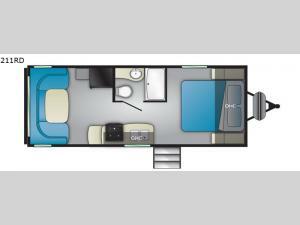 You will also enjoy the comfortable front queen bed. Throughout this model there are overhead cabinets where you can store your personal belongings, and almost straight in from the door is the convenient full bathroom.